Another landmark moment. Cooter finished reading “Harry Potter and the Order of the Phoenix” a couple of weeks ago. Our deal is read it, and then you get to watch it. He had to wait to watch the movie until his big sister Aub came home from college Friday afternoon. He was ready to hit play the moment she walked through the door. Thankfully, he did let me get supper served first. They all loved it. He got through the loss of his favorite character and handled it with strength and only a few tears welled up. (Though he’d never admit it) What’s funny is I had no idea that this was also a Harry Potter Marathon weekend on one of the TV channels. So last night, I found myself sitting up alone, about to write. I clicked through and saw that the very same movie had just started playing. True Confession: The Harry Potter movies are the same for me as Princess Diaries 2. If they’re on, I’m watching. All those moments. The times we sit and just “be” with someone else–talking, listening, sharing, laughing, crying, sitting quietly–all of those moments are stored up as an arsenal against all the hard and dark and broken times in our lives. Store them well. Make all the good memories. Never question the worth of a kind word or a smile to a stranger. Never doubt the good you do when you listen to the story of a young child or sing along to the radio with your friend. Never feel that you are wasting time just sitting with a friend, each of you doing your own thing. Never hesitate to share a laugh or encouragement or affection. All of those things keep the light burning and in times of darkness will guide you home. You matter. Your words and laugh and all you are matter. More than you can ever know. Giving thanks for all the joyful memories I have tucked away and can pull back out when the storms approach. Last week there was a little fella around here who is absolutely, slap dab adorable. There were also two others here I love who are handsome. But the little one–adorable. Because when they are under two, you can get away with calling little fellas adorable. After that, not so much. My nephews. My brother and his family were here, and I realized just how unbaby-proofed my house has become in the past four or so years since Cooter was a toddler. I spent the first day following my eighteen month old little fella around. Not sure what he might think of getting into (not much) or how Miss Sophie would react to someone she no kidding could knock down (she didn’t), I followed him around the counter and through the kitchen and around the table. Over and over. He toted his graham cracker around and became Miss Sophie’s new best friend when he handed it over to her and giggled. After that, she figured out he was the one to watch. When it was naptime, this little fella was allowed his pacy–bink, pacifier, soother, whatever you might call it. He took it happily and put his head on my shoulder and cuddled close. When he fell asleep, I didn’t even pretend to try to put him down. Because I’m the Aunt, and I can get away with that. Today I saw a picture of a friend’s little guy with his “bink” in his mouth. ADORABLE. What is it that draws me to these little ones with their pacifiers? I miss seeing my littles with theirs in their mouth, and it didn’t bother me to give it to them when they were little like that–it helped comfort them. (Which is ironic because I never gave Aub a pacifier–the hospital discouraged it. And so I became her comforter.) They were so cute. I can still picture their little faces. It was a hoot because our Princess was much like her little cousin–one in the mouth and one in the hand. She often smelled hers too. Sorry, sounds disgusting, I guess, but there it is. As she got older she would do funny tricks and weave them together. She also figured out where the magic drawer was that held her extras. As I looked at the picture of my friend’s son, it hit me. I was focusing on his eyes. He was smiling. I couldn’t see his mouth to confirm this, but one look at those eyes and the joy was apparent. And that’s what it is. I love to see joy that is so great it travels to the eyes. So sweet. When Mama had her last HospitalStay, she was on a vent to help her breathe. She wasn’t conscious for much of the 25 days, but one morning during that last week, she was. I was sitting in the horrible STINKU (STICU) with her, and I said something inconsequential. She looked over at me and wrinkled her nose, and from her eyes–she couldn’t move her mouth very easily with the vent–I could tell she was smiling. That smile lit up the room and my heart. And it all came from her beautiful eyes. My spirit lifted. A smile with a wrinkled nose? That meant “I love you” in no uncertain terms. In all of that, a smile. Tonight I’m thankful for smiles that lift the spirit. For smiles that come from so deep within that they bubble out and upward and light up a person’s whole countenance. Children know how to do this without even trying. Some adults haven’t forgotten. I am thankful for the joy that brings on such light and beauty. May something bring you such happiness today that your smile can’t help but fill your whole face. 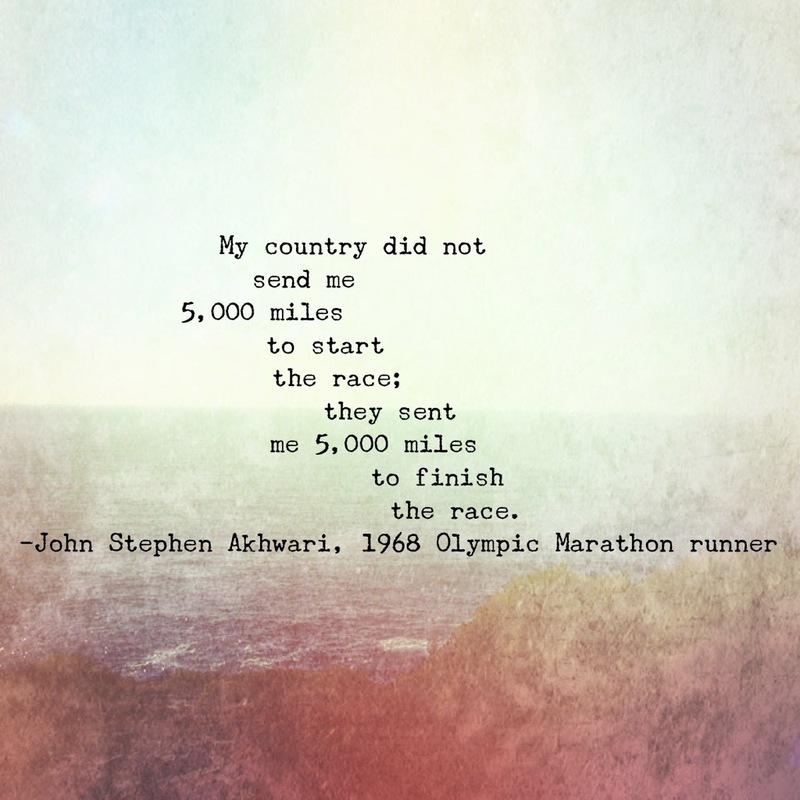 The summer of 1968 when my Mama and Daddy were preparing for my arrival and their new roles as parents, a man from Tanzania, John Stephen Akhwari, represented his country in the summer Olympics marathon taking place in Mexico City. He had never practiced at such altitudes, and during the race, he cramped. Just before the halfway point, when the runners were moving around each other, he was hit. John Stephen fell, injuring his knee and dislocating the joint. He also hurt his shoulder when he hit the pavement. Out of 75 runners who began the race, 57 finished. When the crowd had dwindled and the sun had set, a television crew was sent out when they heard that one more racer was about to finish. John Stephen Akhwari was number 57, finishing an hour after the gold medalist. I had never heard this story before yesterday. The pastor at Trinity United Methodist Church, my Mama’s church, shared the story during the All Saint’s Day service. The story in itself is inspirational. That this runner could finish in all of that pain–the drive, the intensity, pushing through the pain. Yeah. That’s something I could sit and meditate on for a while. Without even hearing the rest of the story. Oh, but the rest of the story! The video played on the screens at the front of the church where the words to the hymns had just been shown. When John Stephen stepped into the stadium and the cheers of the sparse crowd went up, I had goose bumps. His pace seemed to pick up as he got closer to the finish line, and the crowd cheered him on. I can only imagine the pain he was in or the thoughts he was having. What was driving him? Wow. To finish the race. Just starting it is not enough. Follow through. Push past the pain, past the changes that make it hard to breathe, work through the exhaustion. Because we aren’t here just to start, we are here to live until the finish. Don’t give up. No matter how hard I, or we, want to. I can see my Mama nodding now. For almost fifteen months after Daddy died, when I struggled with anger and depression and anxiety, Mama was breathing. She was pressing on through the pain and exhaustion. And the whole time she was running her own race, she was cheering the rest of us on. Encouraging me, all of us, to let go of the hurt and bitterness and live. And Love. After the video screen went dark, John Stephen’s words seem to echo through the sanctuary. It was then that Pastor Lyons spoke to the heart of the story. Not only did John Stephen push through all that would try to hold him back, he knew that he wasn’t in it just for himself. He knew why he was running and whom he was running for. He knew it wasn’t just about him. So did my Mama. Sometimes I forget that, but she never did. She ran her race. She might have been slowed down by what was on the path, but she never stopped and she never gave up. And when the time came, borrowing from an image that Mama’s dear friend and Associate Pastor Hugh shared yesterday, she ran on ahead, finished the race, and headed on up to The House. Yes. That made me smile. I’ve seen my Mama run a few times in my life. When my sister ran because she didn’t want her allergy shots. When I ran from her when I knew I was in trouble. (I paid for that one–you can’t outrun trouble. Unh-uh.) And when that snake jumped out of the tree right at her. But when I think of the image of her running on up ahead on the road, free of everything that had once slowed her down, finishing the race–well, that makes this girl want to stand up and clap sure enough. And give a good and loud hoot and holler. Good job, Mama. Way. To. Go. And now I need to work on getting myself back in the race. To remember why and for whom I am continuing on this path. Mama hasn’t been the only one talking to me lately and cheering me on. 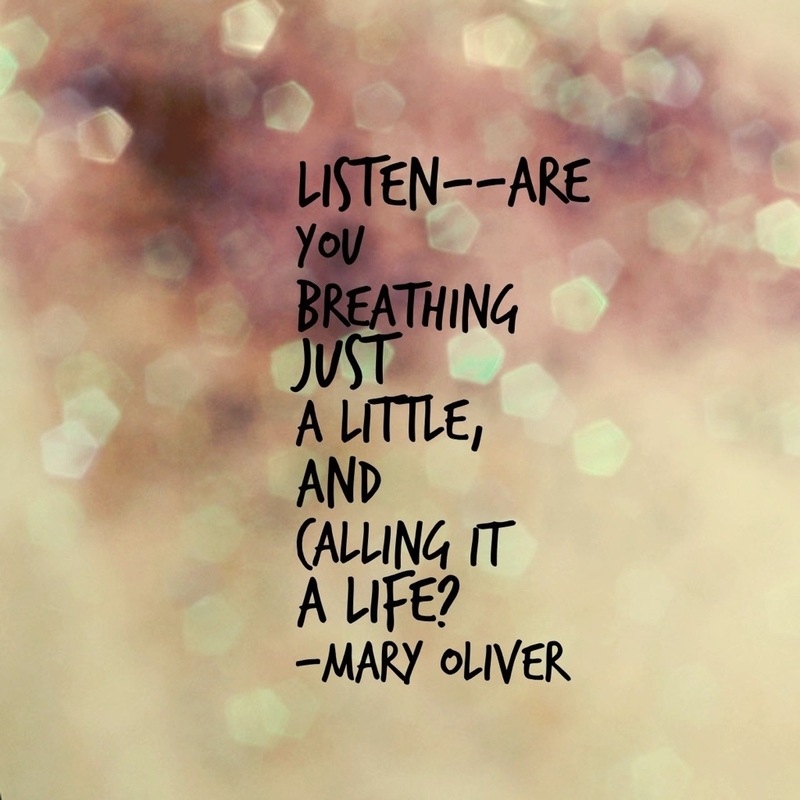 The poet Mary Oliver has as well. No wonder, as she has been compared to Emily Dickinson, my favorite poet. Well, yes ma’am I was. But I’ll stop it. Right now. I’m working on getting that second wind and I’m starting to remember who was beside me as I started this race. They might have run on up ahead to The House, but they wouldn’t be happy if I stopped now just because I can’t see them on the path anymore. No ma’am, I’m going to get my act together and get back in there…..I will, I promise. Just let me catch my breath, and I’ll be on my way. Much of the information about John Stepehn Akhwari was found at http://en.wikipedia.org/wiki/John_Stephen_Akhwari. Over twenty years ago (how did that even happen?) I was director of a child-care center for low-income families whose parent(s) were working or in school. I was still wet behind the ears, but I loved what it was about, so I got in there and let the dear ladies who had been there for many years teach me what I needed to know. Two of the ladies I worked with were over retirement age–Miss Dot and Miss Aileen. At one point Miss Dot had been director of the Center, and while she no longer worked full-time, she loved it too much to let it go completely. She was a wonderful resource and a spunky, sweet lady. She lived with her 90-something year old mother. Who credited her advanced age and good health with eating an apple a day. They both had lived through loss and dark times, but instead of being sad, they were bearers of light and laughter. Oh the stories Miss Dot could tell! Miss Aileen worked as the Administrative Assistant, and she oversaw the food program sponsored by a government program. 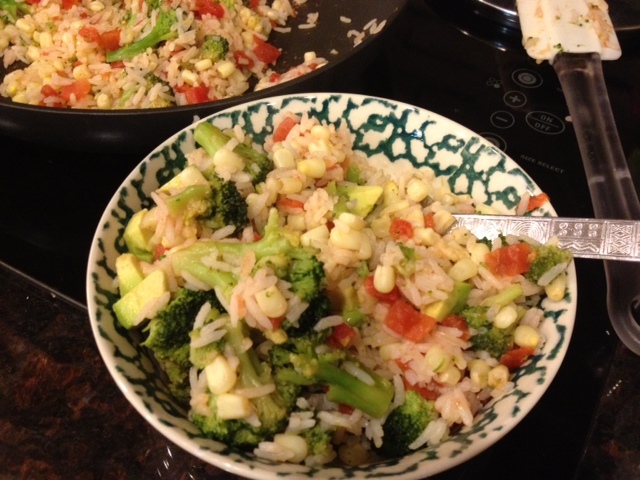 Certain criteria had to be met in the meal planning–breakfast, lunch, and an afternoon snack. The two year olds got a snack mid-morning as well. Miss Aileen planned the menus, did the grocery shopping, and kept up with the paperwork that had to be submitted. She was a busy person, and when it came to feeding our little ones healthy meals, she didn’t play. We had food vendors who tried to sell her on more of the already prepped things like chicken nuggets, fish sticks, reheatable casseroles. She was having none of that. I think she was ahead of her time in a way, as she believed it was important for the children to have home-cooked meals. As a matter of fact, I quit calling it lunch. Whenever I went out speaking about our non-profit agency, I referred to the noon meal as dinner–because most days it was so much more than a lunch. For three and half years, I was lucky enough to get to eat these meals planned out by her and prepared by the loving hands of our two cooks. Some of my favorites were tallerine, salad, and rolls. (I had no idea what tallerine was before I started at the center.) I loved the ham, potato salad (made from scratch), and snap beans. We had chicken pie (again from scratch, including the crust–ooooh, especially the crust), baked chicken, barbecue chicken, homemade macaroni and cheese. Our menus tended to go on a five week rotation, but she was not above switching something up if she found something on sale. One of my special memories is the pancake breakfasts that cycled through a few times a month–delicious and again homemade. When I was pregnant with my oldest, our sweet cook would save me a small plate of them and I would enjoy them with a glass of very cold milk when I arrived. Mmmmm. Our meal we particularly liked to invite guests in for was the chicken tetrazinni, cooked carrots, and butterbeans meal. Delicious. I had the privilege of sitting at a table with both of these women many a day. At certain meals, one of them would inevitably look at her plate after the blessing was said, before taking the first bite, and say appreciatively, “Isn’t this such a pretty plate?” I learned to appreciate the beauty as well as the tastes in planning and serving a meal. Whenever I make an especially colorful meal, I think of them and smile, knowing they’d really be pleased with this one. The thing that I loved and respected about both of these women is that neither took the easy way out. Both well beyond retirement, they chose to be a part of these precious little ones’ lives. They sure weren’t doing it for the money–I know, I signed their paychecks. They did it for the hugs, and, I think, because they took it seriously when they read in the Good Book those things about taking care of the little children. These women definitely didn’t take the easy way out when it came to what was socially acceptable among many of their friends. As our center served almost 100% African American children and their families, they both had friends who didn’t understand why they, both Caucasian, even bothered. Surely they could be spending their time some other way, at the teas and luncheons and charity auctions that helped care for others. It made me sad when one of them shared that she had lost a friend or two who could not grasp why she was spending her time with our children. She looked sad for a moment, and then one of our sweet ones walked by the office and popped in for a hug and a chat. She smiled and I knew where her heart was. They both were much older than I am now when integration occurred. Both born and raised in a culture that was reluctant to let go of its past. No, they did not take the easy path. These two amazing women paved the way and inspired women like me to say no to easy and to stand up for others, especially those who may not have been heard before. They were truly special…..they taught me to love all, no matter what those around me might say, and to appreciate beauty everywhere–even on a dinner plate. Tonight I am thankful for a colorful stir fry that stirred up memories of these colorful ladies, whose lives inspire me to do what is right, no matter how hard it may seem. Such a pretty plate, such a beautiful example. Yesterday evening at the meal we take the drinks to each Sunday at Daybreak, our friends supplied and served the dessert. The joy in being with our friends at this place that means so much to us, with folks we have come to love as family–that’s the good stuff of life right there. The joy and giggles overflowed. 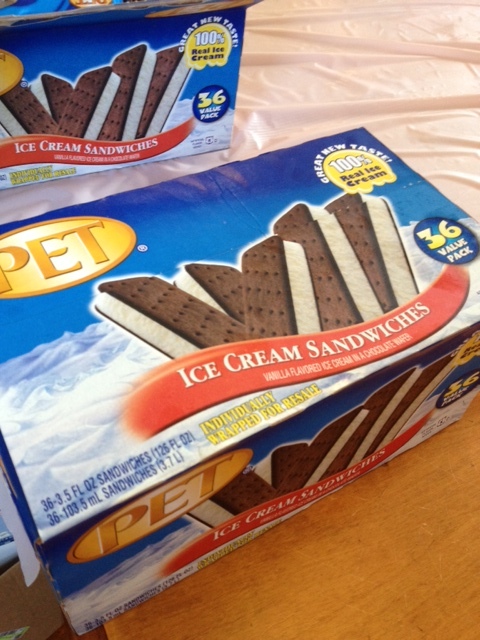 Ice cream sandwiches served last night as dessert–and PET no less. Y’all know how I love me some PET dairy products. As it was Memorial Day weekend, it was decided that a special treat was in order–Ice Cream Sandwiches. It was a couple of years ago that one of my friends had the idea to take them for dessert on a hot Sunday night, and they were the hit of the night. Last night as I looked around at the smiles on faces and the messy fingers with chocolate wafer clinging to them, I thought of our own ice cream sandwich memories. We had them growing up as a special treat, but I really love that they were the “thing” my children enjoyed at “Maemae and Cap’s” house. Mama would pull one out and peel the paper back about halfway down, so they had something to hold onto and could still eat it. Then she’d finish peeling it for each child, when he or she reached the paper. When Daddy was still able to go outside easily, we’d take them out and eat them on the swings under the tree in the summer heat. When my little guy was much smaller, I wouldn’t get my own. I would wait until he hit the halfway mark and was full, and I’d finish his off. It seemed all the sweeter. When he reached the point of only giving me the last bite, I decided I’d better start getting my own. They are one of the foods that just taste like summer to me. When my friend first brought them two years ago when we still gathered outside at the park, I remember several of our friends there were overjoyed to have them and did not hesitate to say so. But it was Mr. U who especially touched my heart. He and his wife seemed to live in their car–we were never quite sure. He had a hard time walking, so in harsh weather, we’d take his meal to him in the car. But that day, he had gotten out and was eating in a chair under the big tree with many others. He pulled my friend aside, and told her how much the taste of that ice cream sandwich reminded him of his own growing up. The sheer joy on his face, his eyes lit up with remembering–that’s something I won’t soon forget. Last night another volunteer and I were remembering him. Mr. U died some time a few months after that day. I miss his smile and his stories. He loved to share his stories with anyone who would listen. I know he would have been smiling about those ice cream sandwiches last night, and sharing stories, but not before finishing his slowly melting treat. Today I remember him. And others who have left this world. Left it a little better, a little stronger, and a little sadder because of their absence. And I think I will toast their memories with an ice cream sandwich of my own. Joyful remembering to you all…..